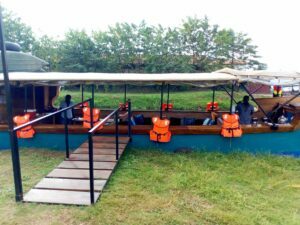 Enjoy an exciting Mvule boat cruise on Lake Victoria. This perfect journey on the lake is an unforgettable adventure. We finally saw Meghan’s red pickup truck down the dusty Nyanza road and watched as she excitedly waved and gestured to us from a distance. Seeing her was a massive sigh of relief for Peter and I. We had been fidgeting with the Google map on my phone for a while and were worried that we would be late for the boat ride. As soon as we parked the car just next to the red truck, we were welcomed with a warm hug from Meghan. We exchanged the necessary pleasantries and made our way onto the boat. The Mvule boat is an alluring colored boat made from hard wood timber from the mvule tree. This is commonly found in Uganda. The hard wood was used in the making of the keel and the supporting frame of the boat. It makes it durable and strong. 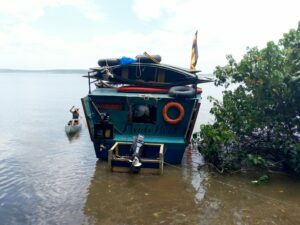 Ten minutes after our arrival, three other friends joined us and we were ready to explore the beauty of Lake Victoria (the second largest lake in the world) aboard the 50ft wooden boat. We were served some tea/coffee and fresh snacks as we gathered around and got comfortable on the seats. The Mvule boat crew introduced themselves to us and took us through some safety procedures in case of a tragedy; we were all impressed by their professionalism and the surplus provisions of life jackets in the boat. The crew has attended a number of first aid training courses and are all certified in first aid and CPR; a sign that the safety of their clients onboard is paramount. The combination of comfy lounge beds, stocked bar with chilled drinks, sun-deck on the front, clean toilet, warm blankets and charging points provided so much luxury. A kind I haven’t seen on many boats in Uganda. We were served some tea/coffee and fresh snacks as we relaxed on the comfy lounge beds and shared a bit of chit-chat with each other. The weather was sunny and warm with plenty of sunlight and clear blue skies prompting us to stand at the front of the sundeck to soak up some of the warmth and take some memorable pictures. The sights of massive jagged rock cliffs, lush forests and untouched distant islands was fascinating. Remote fishing villages could easily be seen from the boat giving us a perfect glimpse of the local culture. We saw an interesting variety of bird species as we cruised along the pristine rainforest; the binoculars and bird books onboard made it easier for us to see and identify them. We saw plenty of monkeys jumping from one tree to the other. It almost felt like they were putting on a show for us! The boat moored at a nice spot where we hopped on to one of the islands. We later took a nice hike up a hill to stretch our legs. 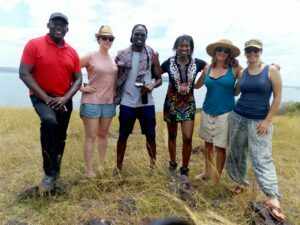 We marveled at the beauty of Lake Victoria and various surrounding islands. This was followed by a swim at a picturesque spot where the water that was 18m deep. It felt quite safe with life jackets and floating tyres available for the weaker swimmers. Reggae music blared out from the boat’s sound system as we relaxed in the water and had a few drinks; and also found a perfect spot that created a little heaven for us on that Sunday afternoon. We got back on the boat and watched our lunch being prepared in front of us. We mixed and matched a variety of ingredients and sauces ranging from onions, French beans, carrots, tomatoes, cabbage, chicken, lean meat, pineapple and cauliflower. The mode in which our lunch was prepared was a pretty unique experience in itself. After lunch, it got a bit chilly and most of us wrapped ourselves with the warm blankets onboard and fell asleep on the comfy lounge beds. The rest enjoyed some ice cold drinks and played board games like chess, backgammon and cards. 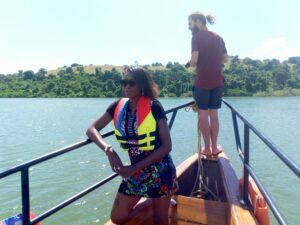 We had another round of fresh fruit, tea/coffee and biscuits on our way back to Jinja marking the end of a day filled with an assortment of exciting adventures of the boat cruise.